Oh boy, here it comes. These warm temperatures are bringing loads of flowers out in the Winterthur Garden. The Winterhazel Walk is almost in full bloom with Korean Rhododendrons and Winterhazel planted with hellebores underneath. The “Wada’s Memory” Magnolia in the Sundial Garden is almost fully open. 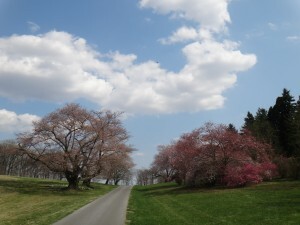 Cherry trees and shrubs are blooming just past Magnolia Bend. 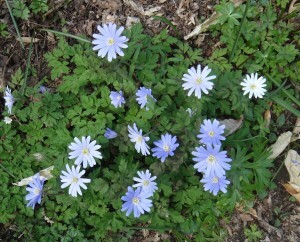 Twinkly Italian windflowers blanket the upper March Bank. Such fun! Too much to tell you about. (Sorry!) Grab your membership card or get an admission tag in the visitor center. 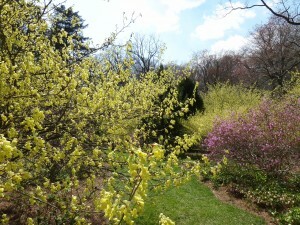 Whatever you do, don’t miss spring in the Winterthur Garden! Recommendation: come at least once a week from now until mid-June to see the unfolding drama and color. 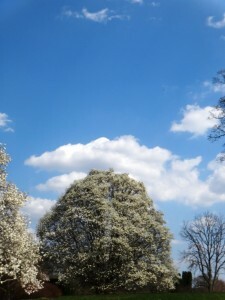 Hi Karen, We love to visit Winterthur and Longwood Gardens when the Azaleas are in bloom. I know that spring is a little later than last year. Do you know what would be the best week to visit to see the azaleas in bloom this year? Last year you gave us wonderful advice, and our visit was perfect. Wanda – 10 Apr 2013 (e-mail: wanda@gemair.com). Hi again, Wanda! I checked in with the horticulturist in charge of Azalea Woods. It’s pretty early to make a prediction, but this is her response: With the push of warm weather this week, I think the Azaleas are on schedule to be at peak color for Mother’s Day week. The temperatures are supposed to be in the seventies next week; the Azaleas will most likely start showing color last week of April. Any way, that’s my guess.